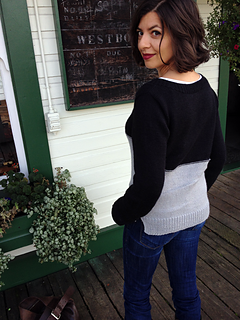 Sweet Jane is a simple pullover with a ton of style. It gets its modern styling from colour blocking, side slits and a step hem. Wear it with your favourite t-shirt and jeans for a casual weekend look or dress it up for work over an oxford and pencil skirt. 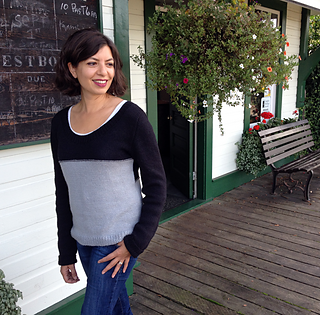 Made from a warm, heathery wool/hemp blend that is lovely to knit, this sweater is a quick and satisfying project. 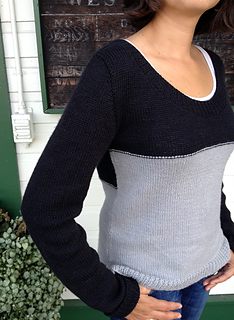 So that the sweater keeps its shape nicely, the front and back are worked flat, then seamed at the sides and shoulders. Sleeves are picked up and worked from the top down, with a knitted-in sleeve cap worked using short rows. Finished Size 33.75 (38, 40, 44, 48, 53)” bust and hip circumference.